We want to thank all the players that have participated in our poll! We apologise since it has been a while since we’ve released poll results due to time constraints. Included in the results are some responses to written feedback to continue our policy of being as transparent as possible. A total of 101 players responded in this poll. Above are the results for weapons in the Global Whitelist. Most responses are aligned with the current whitelist, with the only exception being the Thermal Thruster. Overall most players enjoyed OZF 21 and were able to contact administrators when needed. We’ll continue to make ourselves more available during match days and hours to resolve any arising issues. We do apologise for the multiple server issues that arose during the season, and hope they will not return for the remainder for OZF 22. 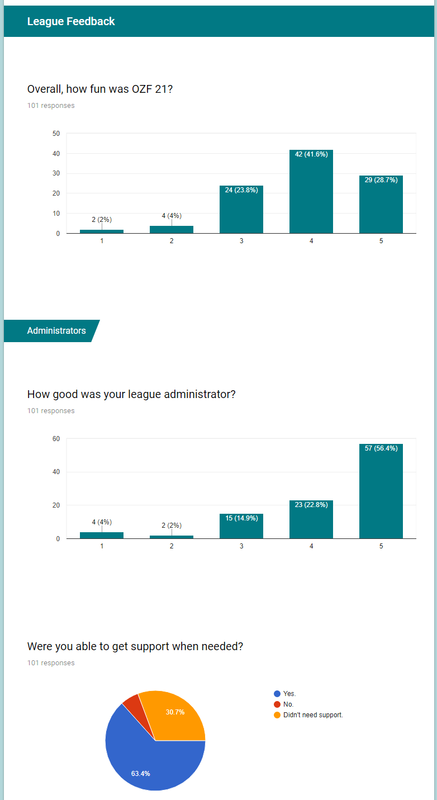 Below is some of the feedback regarding the ozfortress league and ozfortress administrators that we received from the poll. Unfortunately the server running the mumbles and Livelogs died and we haven’t been able to recover the data. We’ve looked into new options and the best way to get the mumbles running again is to fix old software and make it compatible with our new server, hence the delay. The mumbles will be freshly created. Map picks/bans for finals should happen in the server on the night of the match instead of doing them through warzone. If we're scrimming teams throughout the week (and mainly the only people we can scrim are the opposing 2nd team) it just gives us more time to think about what we are banning and also allows us to play a larger pool of maps without being restricted to the maps that we would have banned/picked. In-server map picks/bans don't normally take that long as well if you guys are concerned about time being an issue. Changed in OZF 22 as per Rule 3.5. Map selection can be performed in-game but must be documented on the match page. This is a similar system that ozfortress used prior to warzone. Would like to see matches be able to be played on fridays and saturdays. Me and some of my friends haven't been able to play for a few seasons because we are usually busy with school on weekdays. So would prefer to have matches be able to be played on weekends. Sundays are included in the five days permitted for matches, but each team must be available three out of the five days. Unfortunately we reserve Friday and Saturday to give players a break for social events. It also allows for match organisation to occur between captains, and also administrators to sort matches and transfers. Furthermore, if we allow matches to be played over a full seven day period, players will have to be available four days a week which will cause greater disruption to personal schedules. Penalties for teams that disband, or incentives to stay together. It's not fair or fun for the rest of the teams playing in the league. Captains of disbanded teams receive a captaincy ban for the following season, with repeated disbands leading to extended or permanent punishments. As for incentives for staying together, this is a great suggestion and we will discuss this in our next meeting. This will be discussed and potentially included in OZF 23. For off-season cups, there was overwhelming support for an Old Map Cup. Expect this to occur at the end of this season. The format whether it is a one night cup or over an extended period is yet to be decided. Other responses (not counting the provided responses) included a normal map cup, State vs State, and a map testing cup. 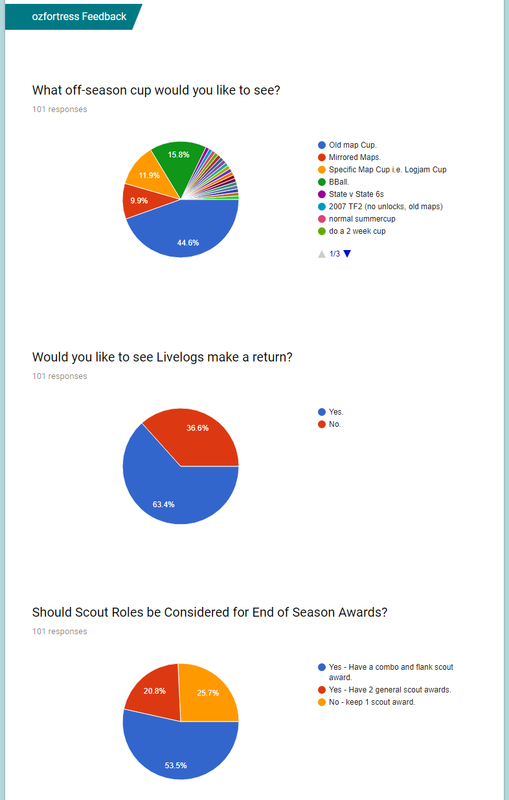 Regarding Livelogs, most players would like to see the service make a return. However there is incredible work required to bring it back alive and we currently lack the technical resources to do so. We acknowledge that it provided live results and showed the booker of the server, but the workload required outweighs the benefits at the moment. For Scout awards at the end of the season, there will be both a flank and a combo Scout award starting from OZF 22. Below is some of the feedback regarding ozfortress as a whole that we received from the poll. as a side note qixalite stv demos are around 35mb for 30 min match while ozf are 60-70? This is due to SrcTV+ which sends makes the server send all events, giving casting organisations more information to work with. This leads to a better stream for you to enjoy! The downside of this is of course larger demo files. Qixalite has also added this to their servers since for your benefit. Somehow endorse streaming within the ozfortress community but showing various live streams on the ozf/warzone website which would further advertise the ozfortress brand to the broader community. Good suggestion, this was considered in the early developments of warzone. Will bring this up again in our next meeting. Alter the map pool, bring back maps such as reckoner and metalworks into the rotation. We try to keep the map pool fresh by introducing newly made maps without destroying the consistency and fun of the ozfortress seasonal league. This means, using the latest versions of current maps and only swapping out one or two maps at a time. Being consistent with international leagues is vital too, taking into consideration international LANs. With OZF 22, we didn't believe that there were any suitable maps to be included. The administrators will continue to follow map developments and assess their potential to be included in the ozfortress seasonal league. We thank you all who participated in the poll, as it helps us greatly coordinate the ozfortress seasonal league. If there is any other feedback that you would like to provide, please message an ozfortress administrator.